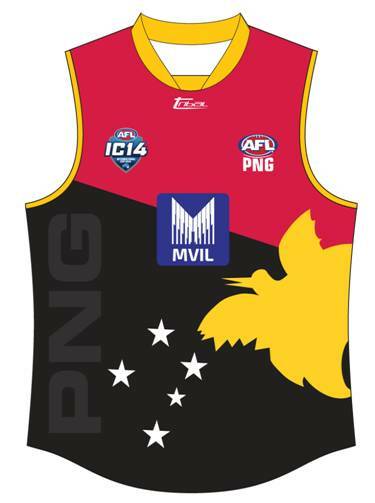 You couldn't help but notice the great AFLPNG jumpers when you saw them at IC14 - thanks to David Lake coach of the PNG Mosquitoes for giving us some background to the new design in the following submission. 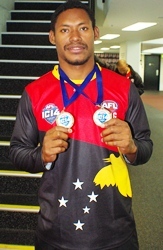 Papua New Guinea launched a whole new look for their country at IC14 in Melbourne in August this year. Earlier this year they met with Tribal Sport Design Director Sam Lake to establish a new look that would display all things that make PNG countrymen stand proud and tall. After displaying a similar look for an extended period they made a decision to fast track into a modern new look that took in the ‘bird of paradise’ and southern cross stars off their national flag. it depicts the Southern Cross and a Raggiana bird of paradise in similar positions to the national flag. The flag has been the country's national look since 1971 when a 15 year old schoolgirl Susan Huhume won a national competition for a new flag design . Red and black have long been traditional colors of many Papua New Guinean tribes. Black-white-red was the color of the German Empire's flag, which had colonised New Guinea prior to 1918. The bird of paradise is also found on the national coat-of-arms. Disclosure: Tribal Sport is a sponsor of the worldfootynews.com website.